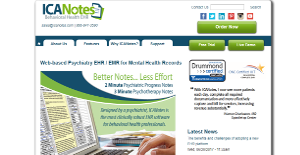 ICANotes is a web-based software solution for managing healthcare records for behavioral health practitioners. It is an EHR-based solution which thinks like a clinician and takes notes through its self-coding features, these notes consist of code generation responses which can be used for recording mental health and other health statuses. It is best suitable to the mid-sized clinics however individual practitioners, as well as small and large health companies, can make use of it. Its key features include charting tools and capabilities, e-prescribing, patient portal, billing and security features. ICANotes can be customized and individualized as per the patient requirements and data, thus enabling the quick diagnosis and response rate to patient needs. ICANotes is popular for its seamless charting solutions, integrated into the EHR software. Documentation is an important part of health practice, and practitioners seem to spend more of their time documenting the details regarding the patients. With ICANotes, they no longer have to jot down everything and transcribe whatever the patient is saying. The self-coding feature of ICANotes does it all, that too in a matter of few minutes. On top of that, ICANotes offers the customization and personalization that comes with every patient’s history of a disease and individual requirements. Despite being an innovative software, it is easy to use and very less training is required for health practitioners to get a grip on this charting workflow and process. It is an add-on for all the practitioners in the health industry. Practitioners can expect the software to provide them with comprehensive yet quick documentation that meets the industry criteria as well. However, if additional training is required by the practitioners, the sales and chat support of the ICANotes can be of great help. Moreover, ICANotes is said to release frequent updates for maintaining compliance with the industry standards as they evolve, and suggestions are also incorporated, provided by the users. If you are considering ICANotes it may also be sensible to check out other subcategories of Best EHR Software collected in our base of SaaS software reviews. It's important to keep in mind that virtually no service in the EHR Software category will be a perfect solution able to meet all the needs of various business types, sizes and industries. It may be a good idea to read a few ICANotes reviews first as certain solutions can dominate exclusively in a very small group of applications or be created with a really specific type of industry in mind. Others may work with a goal of being easy and intuitive and consequently lack complicated functions welcomed by more experienced users. You can also come across services that focus on a wide group of users and provide a powerful feature set, however this frequently comes at a more expensive price of such a service. Be certain that you're aware of your needs so that you get a solution that offers specifically the functionalities you search for. How Much Does ICANotes Cost? We realize that when you make a decision to buy EHR Software it’s important not only to see how experts evaluate it in their reviews, but also to find out if the real people and companies that buy it are actually satisfied with the product. That’s why we’ve created our behavior-based Customer Satisfaction Algorithm™ that gathers customer reviews, comments and ICANotes reviews across a wide range of social media sites. The data is then presented in an easy to digest form showing how many people had positive and negative experience with ICANotes. With that information at hand you should be equipped to make an informed buying decision that you won’t regret. What are ICANotes pricing details? What integrations are available for ICANotes? If you need more information about ICANotes or you simply have a question let us know what you need and we’ll forward your request directly to the vendor.